As spring break is just around the corner (one week away for me… eek!) or already here for most of you, I’ve pulled my three favorite KW designs for a fun little spring break series to help you enjoy your vaca in style. Look number one? An afternoon at the pool! I’m a bit of a pack rat (my roommate swears I take my whole closet with me whenever I leave) and that is every bit as true when packing a bag for the pool, beach, or a day on the lake. 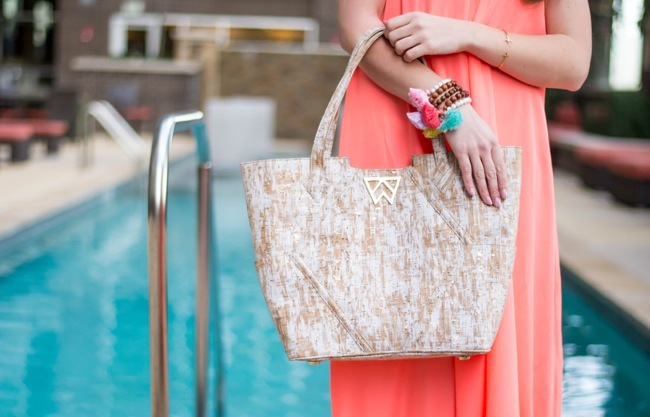 That’s why I couldn’t be more obsessed with this Paint the Town Tote in White Brushed Cork! The size affords plenty of room for all of the towels, sunscreen and snacks you could ever need. I threw it on with this lush, easy maxi (have I mentioned it comes in eighteen colors?) for a pool side look, but shake out all of that and replace with your wallet and a hot pink lip and it immediately transitions into your favorite everyday bag. Versatility at it’s finest? I think so! And can we talk about the gold-flecked cork… if it doesn’t have you skipping for summer, I don’t know what will! 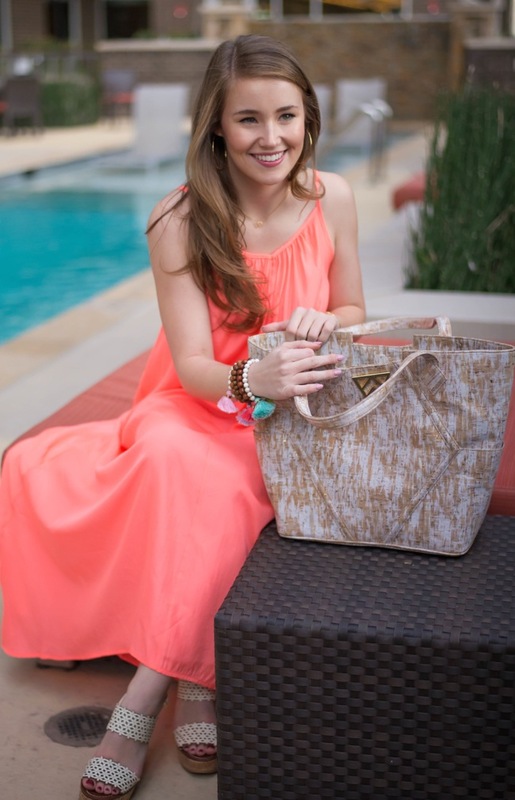 Click directly on the images below to see what all I’m packing in my Paint the Town Tote for a leisurely day at the pool! Be sure to tune back in tomorrow for the next look in my “Spring Break in Kelly Wynne” series. We’re doing a little exploring, and I can’t wait for y’all to tag along! This post was crafted in partnership with Kelly Wynne. Oh my goodness,how lovely does you spring break look? I love the bright color of the dress, and the adorable jewelry.And the tote bag is simply perfect. I really love the color of your dress, would you say that it is sheer at all? Like if I was standing in sunlight?